After a busy week at Sebring — a show that exceeded my expectations …and probably also for several vendors who logged sales to kick off the year in a great way — I have a couple alternative messages for readers. Those aircraft buyers at Sebring have a few weeks to wait before they get their shiny new LSA or kits but, as noted in three earlier posts, plenty of smiles were seen despite a bit more wind than many would have liked. If you follow Facebook, Twitter, Linked In, or Instagram as many pilots do, you may have noticed we've been rather quiet on those platforms. This website and Videoman Dave's YouTube channel form our primary outlets and nothing changes that, especially now that ByDanJohnson.com has been made fully "responsive," a tech industry term that means the BDJ2 web format now adapts readily to smartphones, tablets, TVs, or computers. Stats show that around two-thirds of you view our content on a small screen so we're pleased to look pretty good whatever device you use. Use comments to offer any input you may have on that. Recently, we added a line of social media icons below each article. 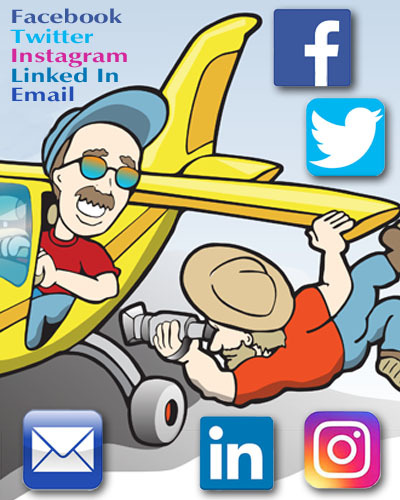 Those of you active on any of those social media platforms can now easily share an article of interest with your flying friends. We hope you'll do that. We get plenty of good comments (and a few gripes) about what we do here and on YouTube and I want to say we are grateful for that feedback. Hearing good words motivates us to do more and criticisms help us further improve our product. Both are appreciated. If you like what we do, please, share the words or video with your friends and help up reach further. You likely know the drill: simply click the social media of your choice, which opens a portal allowing you to use your membership on that platform to send your friends or followers our article or video. After a busy week at Sebring — a show that exceeded my expectations …and probably also for several vendors who logged sales to kick off the year in a great way — I have a couple alternative messages for readers. 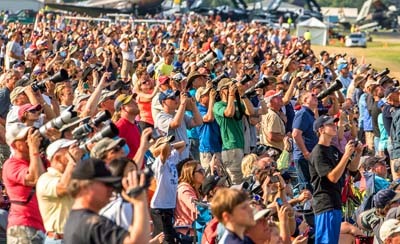 Those aircraft buyers at Sebring have a few weeks to wait before they get their shiny new LSA or kits but, as noted in three earlier posts, plenty of smiles were seen despite a bit more wind than many would have liked. Social Media Update If you follow Facebook, Twitter, Linked In, or Instagram as many pilots do, you may have noticed we’ve been rather quiet on those platforms. This website and Videoman Dave’s YouTube channel form our primary outlets and nothing changes that, especially now that ByDanJohnson.com has been made fully “responsive,” a tech industry term that means the BDJ2 web format now adapts readily to smartphones, tablets, TVs, or computers. Why Should You Care About Sport Flying in China? My guess is most readers do not care particularly about recreational aviation or sport flying in China. After speaking to many pilots at airshows, I know Americans are somewhat aware of flying in other nations but we enjoy so much freedom to fly in the USA and we have so many choices of aircraft, airports, and flying gear that the rest of the world seems almost irrelevant. We most definitely are the lucky ones. We can and do take for granted the idea of hopping in your airplane — whether ultralight, LSA, or a speedy four passenger GA aircraft — and flying to a pancake breakfast or for one of those $100 hamburgers. We can fly almost anywhere we want, anytime we choose, for hour after hour if we like. Sure, some airspace is closed to us or perhaps too congested but, by and large, we can do what we want in the air. I love it. You love it. People in other countries want to love it. 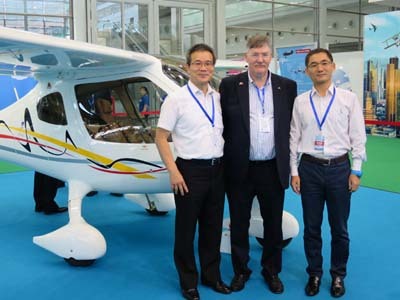 AeroJones, builder of the CTLS for the Asia-Pacific region, aims to become a leading supplier of Light-Sport Aircraft to China. Chinese aviation enthusiasts simply marvel at that level of freedom. With their government tightly controlling all manner of activities, flying around their beautiful country to see it as we can America, is a dream of the future and possibly one that may never match our freedom to fly. 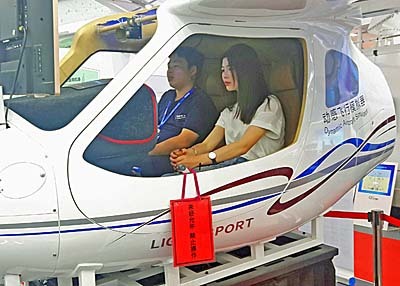 Nonetheless, China may be THE growth market for recreational flying. I recently made a trip to China and Taiwan to offer officials and magazine writers my vision for how sport flying in China could develop. After carefully considering the repercussions and after asking local friends for advice, I offered several influential people and groups a friendly challenge: Create 1 million pilots in ten years. To my surprise and delight, some immediately accepted the challenge. You see, the central government — which has immense power and control — has placed a very strong focus on creating airports …thousands of them, perhaps 20,000! Whatever the number, I find this a fascinating national objective. I have zero doubt China can build the airports. It is perfectly obvious this industrious country can build anything — literally anything — they want. I've never seen so many construction cranes and this is true nearly everywhere you look. In the central city of Anyang, billing itself as the sport flying capital of China, I toured a massive construction development. 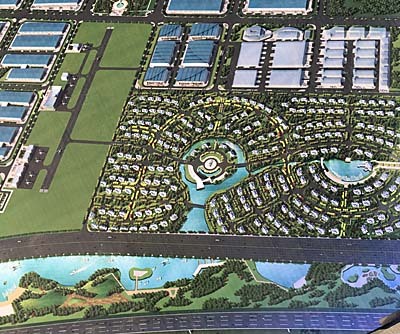 It will include the usual collection of very large buildings complete with a handsome new airport and runway but also an airport flying community, roughly imitating the one in which I live: Spruce Creek Fly-In. It will also include — get this! — an aviation theme park. I marvel at their ambition. All this will create structures but it does not speak to the use of those airports. China desparately needs guidance on building an aviation infrastructure. I leaned on my experience to suggest the creation of flying clubs, flight schools, and a fleet of sport aircraft. 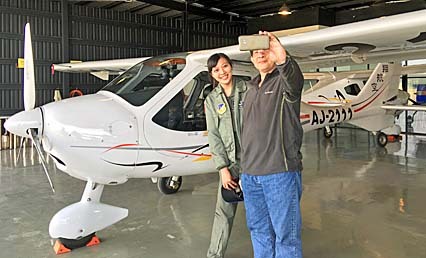 This does not pose any threat to a nation used to 100% control of its airpace and it offers the Chinese citizen a new form of recreation and education plus a wholesome family activity that may prepare some for a respected occupation as professional pilots. 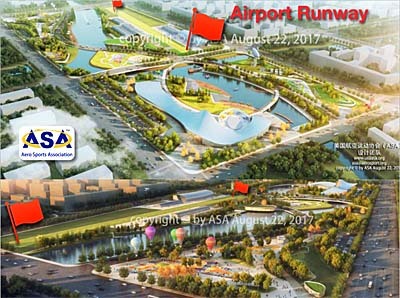 An aviation theme park plan created by ASA, Air Sport Association, created by Chinese American, Shudong Li. You may still not care. I understand that. But to builders of aircraft and other aviation enterprises, a million new pilots would be like winning the lottery. Today, in all countries of the world and for all forms of flying, we have something north of one million pilots …in the entire world …combined. Could China create that many new pilots all by itself? It has the population, the national drive, the money, and the land to achieve this. Will it? Only time will tell. I tried to do my part as it could benefit the industry I love and which has sustained me for years. Best of luck, China. I hope you find your path to the sky. Meanwhile, Merry Christmas to readers of ByDanJohnson.com. I wish each and every one of you warm and wonderful holidays. My guess is most readers do not care particularly about recreational aviation or sport flying in China. After speaking to many pilots at airshows, I know Americans are somewhat aware of flying in other nations but we enjoy so much freedom to fly in the USA and we have so many choices of aircraft, airports, and flying gear that the rest of the world seems almost irrelevant. We most definitely are the lucky ones. We can and do take for granted the idea of hopping in your airplane — whether ultralight, LSA, or a speedy four passenger GA aircraft — and flying to a pancake breakfast or for one of those $100 hamburgers. We can fly almost anywhere we want, anytime we choose, for hour after hour if we like. Sure, some airspace is closed to us or perhaps too congested but, by and large, we can do what we want in the air. One company making a splash at the brand-new DeLand Sport Aviation Showcase event that opened today was AeroJones, occupying the first two spaces inside the entrance. I've written about this company before but since spring a striking change has occurred. After the transaction is fully completed AeroJones Aviation will own the CT line including the current CTLS and CTLSi. They will also pursue completion of Flight Design's four seater, C4, that flew in 2015. 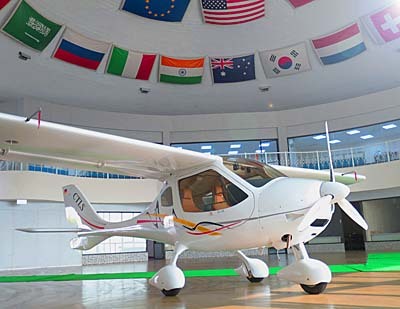 AeroJones Aviation is headquartered in Taichung, Taiwan, often referred to as the "Silicon Valley of Taiwan." 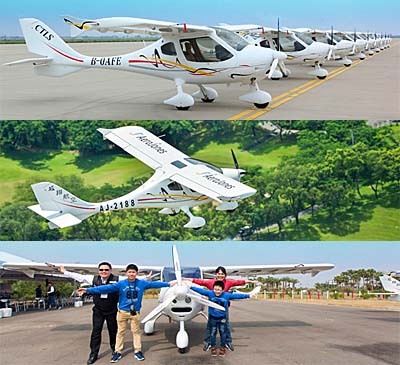 After first acquiring a license to build Flight Design aircraft more than two years ago, the company went through a thorough training and evaluation from Flight Design officials. 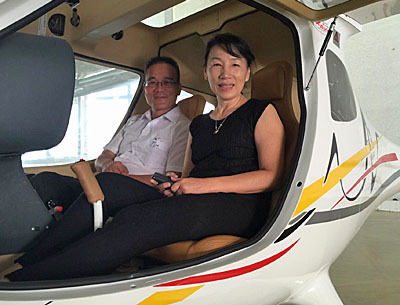 Aircraft production began for the Taiwanese company after they installed new production tooling and equipment including a five-axis CNC machine, water and Laser cutters, TIG welding, composite layup and post-cure ovens, plus a modern paint booth. 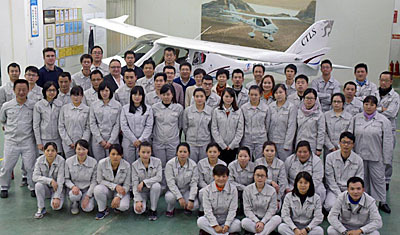 Flight Design provided production worker training and quality management training. AeroJones finished their first airplanes in 2014 and has since been refining the production and quality systems. Proving their skills to government officials, AeroJones' production facility passed numerous audits and earned a Production Certificate from China's CAAC at the end of 2015. Initial CTLS and CTLSi supplied by AeroJones to American distributors and dealers won good marks. "The quality was very good," said Tom Gutmann, the country's largest Flight Design distributor, having delivered more than 100 aircraft. "AeroJones personnel spent several days with us and in great detail documented every minor issue we found in the first aircraft. We were impressed how carefully they listened." "AeroJones Aviation will be established in Florida as a centralized assembly and distribution facility for the AeroJones Aviation-produced CT series aircraft" said Chris Benaiges, CEO of AeroJones Americas. Chris has been associated with Flight Design and their CT series for several years; he and partners stepped in to restore the distribution of these aircraft after the court reorganization. "AeroJones Aviation is pleased to bring renewed life to the very popular CTLS in America," said Hsieh Chi-Tai, Executive Vice President at AeroJones. "We are pleased to work with our U.S. representatives at AeroJones Americas as we resume shipments of CTLS to America." "AeroJones Americas will have the resources to bring safety, quality control, and the end user experience to a new level for the CT series," stated AeroJones Americas COO John Hurst. One company making a splash at the brand-new DeLand Sport Aviation Showcase event that opened today was AeroJones, occupying the first two spaces inside the entrance. I’ve written about this company before but since spring a striking change has occurred. Flight Design — originator of the market-leading CT-series of LSA — has completed a court-appointed reorganization. Many of the former company team members will take certain assets and move forward. I will have more on that in a future article. After the transaction is fully completed AeroJones Aviation will own the CT line including the current CTLS and CTLSi. They will also pursue completion of Flight Design’s four seater, C4, that flew in 2015. 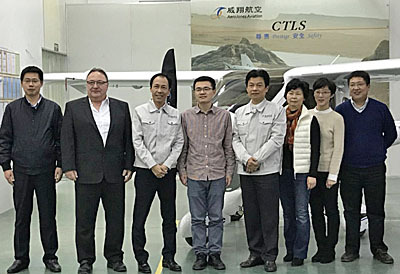 Introducing the new owner of America’s popular CTLS… AeroJones Aviation is headquartered in Taichung, Taiwan, often referred to as the “Silicon Valley of Taiwan.” After first acquiring a license to build Flight Design aircraft more than two years ago, the company went through a thorough training and evaluation from Flight Design officials. Doing What We Do... Interviewing Hsieh Chi-Tai of AeroJones Aviation about his Taiwan company's manufacturing of the Flight Design CTLS for import by Flight Design USA. Paul Mather (L) shakes hands with Zenair CEO Matt Heintz after they inked a deal to join forces in creating a new SLSA version of the popular CH 750. 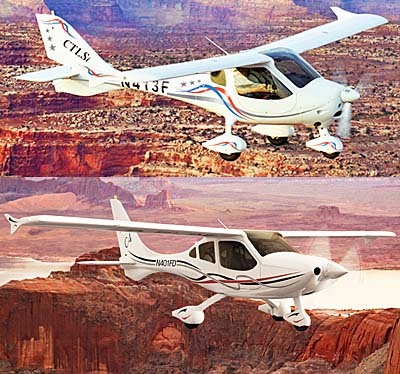 Fixed wing Part 103 ultralights continue to attract buyers and the choices are broadening. In this file photo we see the lightest Quicksilver Sprint. Sleek, smooth, and looking jet-fast is this new P&M Aviation entry called Pulsr. 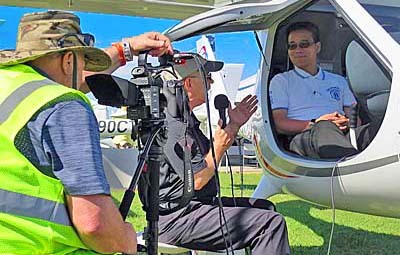 Rob Rollison of Aerotrek gives an interview for the new ELA gyroplanes he is representing including this very handsome Eclipse 10. Miguel Soto has it down pat, completely tearing down and reassembling the Titan 180 horsepower engine in their display — twice! — during Sun 'n Fun. Videoman Dave's camera is mounted high to capture time-lapse imagery of the whole event. The super-short summary of Sun 'n Fun 2016: weather was beautiful; even the one night of rain gave way to a sunny day and all other days were as good as it gets. No accidents occurred to my awareness. Crowds were good if not record-setting. Airplanes were sold; I conservatively estimate about 30 sales of light aircraft, based on my inquiries. What's not to love? As with any such attempt to cover an event the size and breadth of Sun'n Fun, this article cannot include all deserving aircraft, with regrets to any not mentioned below. We also shot lots video that will follow as the editing can be done (photo). This article is longer than I prefer but I have plenty to tell you and I was simply too engaged during the event to keep posting. So... let's get going! AIRPLANES (three-axis control) — Sun 'n Fun drew all the wonderful light airplanes we love but a few were touting fresh news not previously reported. One of the most significant developments was a Zenair of Canada collaboration with Alabama's M-Squared Aircraft. They inked a deal for M-Squared to fully assemble the popular "Sky Jeep" CH 750 and deliver it as a fully-built Special LSA. Some years ago AMD and then Eastman built the popular STOL aircraft (as the 701, at that time) in a partnership with Zenair but it's been a rather long time since you could buy a ready-to-fly 750. That will change by summer; M-Squared boss Paul Mather reported the first subassemblies are being manufactured now. He expects to build perhaps 10 in 2016, ramping up as demand suggests. This is a smart move by Paul who will continue to make his also-SLSA Breese 2 among other models. I reported earlier that Progressive Aerodyne won Chinese CAAC approval for their Searey amphibian, without a doubt the most successful light seaplane. 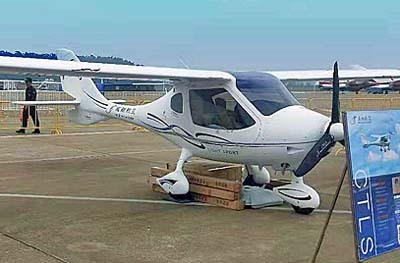 Given a (presently) small market for that populous country and with 11 aircraft already shipped, Searey may have bragging rights as the best-selling LSA in China. Congratulations to Adam Yang, Kerry Ritcher, and the Searey gang. Given Icon A5 pricing soaring past the $200,000 barrier, Searey is a relative bargain for an aircraft with more 500 already flying (most built as kits). 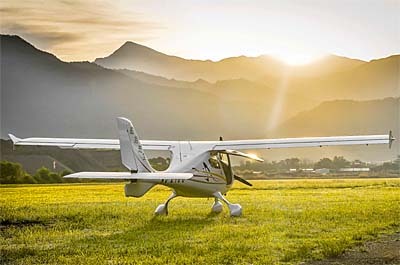 Jabiru North America (their new company name) boss Pete Krotje was pleased to announce the first Jabiru J170-D will appear at Oshkosh, sporting a value-oriented price tag below $100,000 for a surprisingly well equipped aircraft. It should work well in flight schools, he believes; I think individual pilots could flock to the model. Pete's company will also debut new models of engines: their 81 horsepower 2210 four cylinder and 120 horsepower 3310 six cylinder. We saw the first U.S. appearance of the handsome all-metal low wing Viper SD4 from Tomark Aero. Work is underway to gain SLSA acceptance though this may be some time off yet. They will reportedly also debut their high wing Skyper at Aero. I'll be looking for it next week. 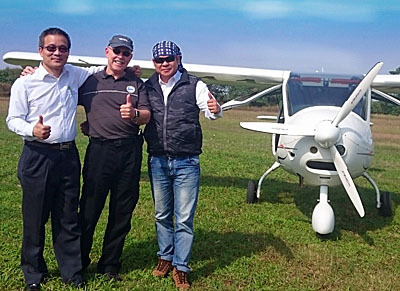 Flight Design USA had a "come-back" show, we heard, thanks to their new arrangement to buy completed SLSA versions of their popular CTLS from AeroJones Aviation of Taiwan. They said the first aircraft will soon be delivered to distributors. The company is offering their 202 model, all ready with ADS-B gear. However, in work with consultant John Hurst, they also announced an ADS-B Out solution for the 400 existing owners of CT-series LSA. PART 103 (ultralights) — Although too many people mistakenly believe otherwise, the world of Part 103 fixed wing aircraft is alive and well. At Sun 'n Fun, we did a video interview with Dennis Carley about his kit version of the hot-selling Aerolite 103. He's doing that to offer shorter delivery times while he facility is working to capacity (about 50 aircraft per year). Kits will also allow non-103 customization some customers want. We also did a video interview with Kolb Aircraft's Bryan Melborn about his tricycle gear version of the Part 103 FireFly, dubbed the TriFly... and they don't mean you have to try and fly it. They can build you one for around $25,000 or save you a bit with a kit you can customize. Kolb's display TriFly had a Rotax 447 mounted; that engine is out of production but many are available in good condition and, yes!, Bryan said TriFly can make Part 103 with that engine. 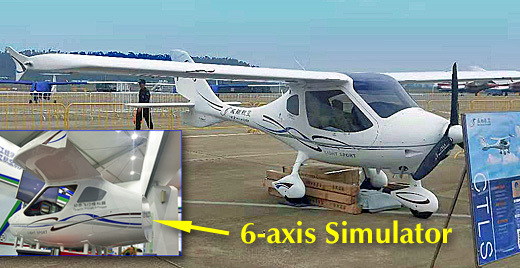 Other news involving three-axis Part 103 aircraft invoke two well known brand names: Quicksilver and CGS Haw. Both are very longtime players in the light aircraft space and both have just gone through major organization changes. Quicksilver sold all inventory and numerous fabrication tools — "several semi-trailers worth" — to Bever Borne's Air-Tech Inc., operation in Reserve, Louisiana near New Orleans. Bever has been a Quicksilver man far longer than anyone at Quicksilver so he's arguably the best choice to hold all the cards. However, the California company has reportedly also signed an agreement with Aero Adventure to manufacture kit versions of the line at their DeLand, Forida operation. We'll watch to see how this plays out since the company restructured last summer. Terry Short bought all the inventory, tooling, and rights to the CGS Hawk line. He had a booth space to talk to prospective clients but declined to do a video interview until he is better set up; the deal only transacted a couple months ago. WEIGHT-SHIFT (trikes) — We saw several interesting new trikes at Sun 'n Fun 2016. 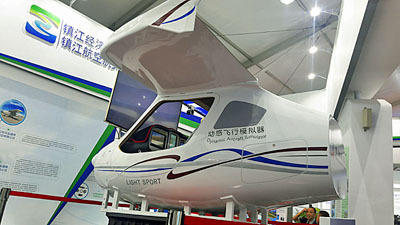 Among them was the P&M Aviation Pulsr that managed to score a Light Sport Innovation Award from the judges. Congratulations to representative Tony Castillo and the British design team lead by Bill Brooks. Pulsr manages to look fast sitting on the ground with its sweeping windscreen smoothly integrated to the aft carriage and engine cowl. Evolution Trike, with the most colorful trike hardware on the planet, had a new Polini engine installation on their single seat, Part 103-capable Rev. This fascinating lightweight engine has gear drive and a clutch to make for a smooth-running single banger packing 35 horsepower. Between Rev and Revo, this Zephyr Hills, Florida company is always one I watch closely. 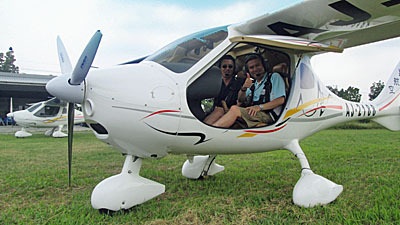 Tiny and superlight — and quickly foldable to fit in your sedan or light truck — are the operative terms for the Aeros Nano Trike (ANT), made especially for hang glider pilots who no longer want to run their take-offs or landings. This highly successful producer of competition-winning hang glider wings is helping their customers fly longer more comfortably. The Ukraine company is represented in the USA by SilverLight Aviation. GYROPLANES — Rotax Aircraft Engines, the dominant player, by far, supplying powerplants to the light aircraft field around the world, has in recent years said they sell more 912 engines to gyroplane producers than any other aircraft segment. 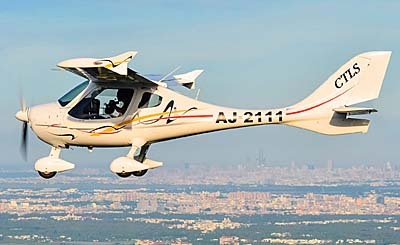 Between Germany's AutoGyro (which has delivered around 2,000 units) to Italy's Magni (900 units) to Spain's ELA (700 units) and all other builders (about 500 units), this class is exploding... although in the USA, one can only say it is growing because owners have to build their aircraft from kit as FAA never completed the goal of allowing a Special LSA version. The agency's sluggishness to remedy this situation, despite years-long efforts by industry, brought segment leader AutoGyro to pursue Primary Category approval, a significantly-costlier and more complicated process than following ASTM guidelines (standards for gyros have been done for years). As reward, the company will be able to sell fully-built gyroplanes to Americans, though that approval may not carry over to other countries. SilverLight made a public debut with their brand-new American Ranger AR-1. Developer Abid Farooqui, with whom we shot a video interview, said he went from concept drawings to completed aircraft in barely over nine months. Having given birth, SilverLight has created the first American gyroplane in the modern European style... all "Made in the USA!" (except for rotor blades, from France). SilverLight is an unusual light plane supplier representing a fixed wing aircraft, weight shift trikes (both by Hungarian builder Apollo), and their new gyroplane. Abid is also a well qualified engineer and ASTM expert who has helped several other companies. Impressive! Speaking of impressive, people practically drooled over the very sleek ELA Eclipse 10 gyroplane being offered by Rob Rollison's Indiana-based Aerotrek. We've seen their open cockpit gyroplanes before but Eclipse 10 made its American debut at Sun 'n Fun 2016. Only a handful are flying though the Spanish builder has a solid track record with earlier models. POWERPLANTS — What goes up... must have an engine to do so. We looked at several, interviewing several officials. Market leader Rotax, represented by Aircraft Engines Manager Marc Becker reported the new 915 iS engine debuted at AirVenture 2015 has more than 50 flying hours and some thousands of hours logged on the dynamometer in their factory test cells. The engine is highly awaited by many in the LSA field and Marc noted several dozen airframes are working with the design now. The 915 iS features the fuel injection of its 912 iS sibling but adds a 5:1 turbo that will deliver a high percentage of power up to 20,000 feet or more. So potent is it that an intercooler is needed and the new equipment needs planning by airframe builders. The company is consistent in saying the new engine will be available, all certified and ASTM approved by the latter half of 2017. Continental's super-powerful, 180-horsepower Titan line is finding increasing support. 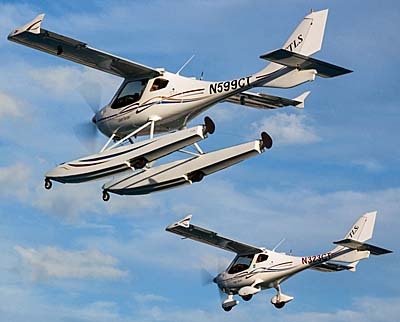 CubCrafters started the parade but is now followed by Zlin's Savage Outback, American Legend, Kitfox Aircraft, Just Aircraft, Rans, and Vickers for the Wave seaplane LSA. Continental bought developer ECi last year and all signs are full speed ahead for this powerplant with a surprisingly good power-to-weight ratio. The company did a public tear-down and rebuild of a Titan engine in their display... twice. We mounted a camera set for time-lapse imagery to record the whole process. We think you may enjoy this when ready. Belgium's UL Power is another company with growing acceptance, with more airframe companies giving one of their models a try. U.S. representative Robert Helms — who enjoys referring to himself as a "recovering lawyer" since he ditched the suit to pursue something more gratifying — took time away from his display to moderate three of LAMA's panels (see below) and participate in one of them. Robert reported that the Belgium-based creator of these high-tech engines (even featuring FADEC) is working to meet ASTM standards that could one day result in engines being factory installed on SLSA. In the One-More-Thing department made famous by former Apple CEO Steve Jobs, work by Aircraft Spruce deserves a mention. The company is geared up to address homebuilders who want to speed the building of panels. The publisher of a giant 1,000-page+ catalog has a division of their company that custom builds wiring harnesses making the addition of a wide variety of avionics faster, easier, and more accurate than many kit builders might manage on their own. We did a video on this subject; watch for it in the weeks ahead. DEBATES — I'll end this rather lengthy recap with something that kicked off the event and ran the first four days. I refer to the "Great Debates in Paradise City." In its big tent in the light plane area of Sun 'n Fun 2016 — made possible with generous support from Aviators Hot Line — LAMA hosted four debates. The first on Tuesday featuring engines for light aircraft, including Continental Motors and their Titan line, UL Power, Rotax Aircraft Engines, and Jabiru; next on Wednesday, a debate between four top aviation journalists including writers for General Aviation News, Flying magazine, Plane & Pilot magazine, and AVweb; on Thursday, LAMA collected four leading avionics producers including MGL, Dynon, TruTrak, and Levil; and concluding on Friday were all the best-selling iPad and Android apps featuring ForeFlight, Seattle Avionics' FlyQ, WingX Pro, and Garmin's Pilot. A sincere thanks to all 16 panelists for taking time out of their busy days to participate and to the Flying Musicians Association for arranging professional-grade public address equipment to make it work. All four debates were captured by Videoman Dave for his YouTube channel. In the way of the Internet, all these are freely available, but I encourage you to support his efforts by subscribing annually or get a great deal on hisLifetime offer. Tomorrow, I blast off for southern Germany and the Aero Friedrichshafen show, where I hope to make more frequent posts about cool aircraft and gear I find in Europe. The super-short summary of Sun ‘n Fun 2016: weather was beautiful; even the one night of rain gave way to a sunny day and all other days were as good as it gets. No accidents occurred to my awareness. Crowds were good if not record-setting. Airplanes were sold; I conservatively estimate about 30 sales of light aircraft, based on my inquiries. What’s not to love? As with any such attempt to cover an event the size and breadth of Sun’n Fun, this article cannot include all deserving aircraft, with regrets to any not mentioned below. We also shot lots video that will follow as the editing can be done (photo). This article is longer than I prefer but I have plenty to tell you and I was simply too engaged during the event to keep posting. So… let’s get going! AIRPLANES (three-axis control) — Sun ‘n Fun drew all the wonderful light airplanes we love but a few were touting fresh news not previously reported. Flight Design's nearly-ready-for-flight four seat C4 seen in taxi testing. AeroJones President Jones Chen (L) shown with Flight Design GmbH CEO, Matthias Betsch (C) and Flight Design USA President, Tom Peghiny (R). We are heading into a weekend with a couple wonderful airshows immediately ahead. The dry spell since Sebring is over and Aero Friedrichshafen in Germany starts next week — preceded by meetings of the ASTM committee that writes the LSA standards. A couple days after Aero ends, Sun 'n Fun starts. Whew! This is a tight schedule but what could be more enjoyable than going to airshows and finding lots of new airplanes about which to write and shoot new videos. I hope you'll click back regularly to see the latest. Meanwhile I have some fun bits of news to report here. Perhaps the best is that we obtained "spy photos" of Flight Design taxi testing their C4 in anticipating of their first flight (more below). Plus, Van's Aircraft, the world's largest producer of kit aircraft, set a new record. Let's get started. Flight Design has been at work on their four seater C4 for several years and it is finally nearing conclusion. We expect to have news of the first flight very soon. The aircraft is a spacious four seater with three doors, the aft of which was planned to be a rear-hinging door. Sometimes called a "coach door" the configuration should make for much easier entry to the rear seat, however, for safety the aft door cannot be opened without opening the front door. 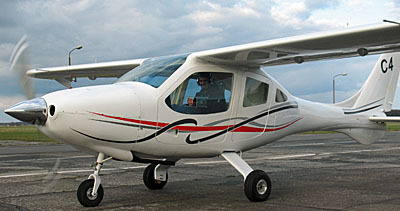 Performance is expected to substantially exceed a Cessna 172 while using less fuel and selling for $150,000 less than a new Skyhawk. C4 is powered by Continental Motor's newly certified IO-360-AF, and alternative fuel engine. Flight Design was recently in the news for their new factory in China that is currently preparing to build CTLS Light-Sport Aircraft. 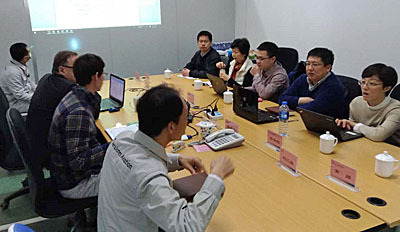 They are currently working with the CAAC (China's FAA) to obtain what is called Type Design Approval (TDA). "Now that AeroJones has completed building four prototypes culminating in a fully conforming article, they can begin the effort for serial production," explained Christian Wenger, a director of Flight Design in Germany. He added, "AeroJones's manufacturing work builds on an organization foundation by Daniel Guenther and Andrey Yavniy of Flight Design. "Andrey was the man who doubled Ukraine production [of CT LSA] during 2005 to 2007 with more than 250 aircraft delivered in 2007." "AeroJones parent company GSEO, based in Taiwan, has worked in China for 20 years building high-tech optical products," said Flight Design CEO Matthias Betsch. "GSEO customers are known as very demanding buyers who go to great lengths to assure vendors match design quality. 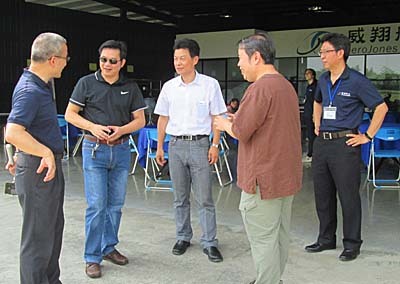 GSEO President Jones Chen brought his experience and his passion for aviation into AeroJones." 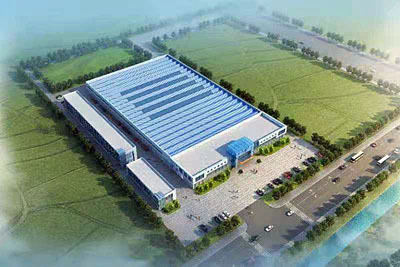 "In cooperation with the province of Jiangsu, AeroJones is breaking ground on a 250,000 square foot, brand-new production facility based in Changzhou," added Betsch. 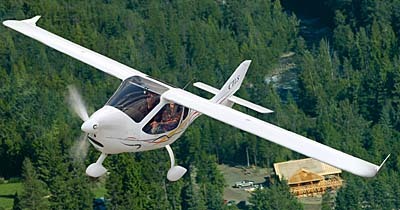 AeroJones will produce airframes for the Light-Sport CTLS as well as Flight Design's four seat C4. Now, for something completely different ... Just today Van's Aircraft reported a first-flight report from Mr. Thomas Damm, of Billund, Denmark. "Thomas' RV-8 became the 9,000th RV kit to be completed and flown by a customer," exclaimed Van's. "Mr. Damm bought the barely-started kit from a close friend and completed it over a span of nine years." Thomas flies airlines for Scandinavian SAS and made his first flight on April 8, 2015. "On the first flight I saw 170 knots at 5,000 feet at [less than full power]. You guys produce great airplane kits," Tom wrote to Van's Aircraft. The folks in Van's Aircraft's engineering department, obviously very pleased by reaching this benchmark, assembled a few of what they called "thought pictures." They noted that assuming an average wingspan of 27 feet with no gaps, 9,000 RV aircraft parked wingtip to wingtip would form a line of aircraft 46 miles long ... and, a rectangular grid of airplanes would be roughly 2,788 feet by 2,362 feet that, with a couple inches of space between wingtips, would cover about 151 acres ... and, assuming an average of 180 horsepower per RV, the total fleet of 9,000 aircraft would generate 1,620,000 horsepower. That should power you through the weekend. BREAKING NEWS! — On April 9th, Flight Design successfully flew their C4 in a 40-minute initial flight that reportedly went very well, with the C4 at reduced throttle outrunning a Cessna 172 chase plane at full throttle. I'll have more as soon as the company releases it. Congratulations to the whole Flight Design team! We are heading into a weekend with a couple wonderful airshows immediately ahead. The dry spell since Sebring is over and Aero Friedrichshafen in Germany starts next week — preceded by meetings of the ASTM committee that writes the LSA standards. A couple days after Aero ends, Sun ‘n Fun starts. Whew! This is a tight schedule but what could be more enjoyable than going to airshows and finding lots of new airplanes about which to write and shoot new videos. I hope you’ll click back regularly to see the latest. Meanwhile I have some fun bits of news to report here. Perhaps the best is that we obtained “spy photos” of Flight Design taxi testing their C4 in anticipating of their first flight (more below). Plus, Van’s Aircraft, the world’s largest producer of kit aircraft, set a new record. Let’s get started. Flight Design has been at work on their four seater C4 for several years and it is finally nearing conclusion.